The late John D’Angelico was one of the most influential and skilled American luthiers of the 20th century. His guitars, largely arched top models, were used by the most accomplished performers. At the time of his death, James D’Aquisto took over the shop. The D’Angelico family has recently entered into licensing agreements and worked with highly skilled guitar designers to produce guitars worthy of the D’Angelico name. 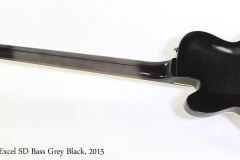 These instruments are designed in the USA, and at least some of the line is built in factories with good reputations for quality build and attention to detail. 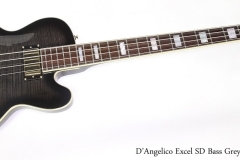 Here, we’re looking at a D’Angelico Excel SD bass, solid but chambered for weight relief, in a gloss ‘Grey Black’ finish. The top is carved Flame Maple, the back is arched Indonesian Mahogany, the neck is 3-piece – Mahogany with a Maple center strip, and a bound Rosewood fingerboard. 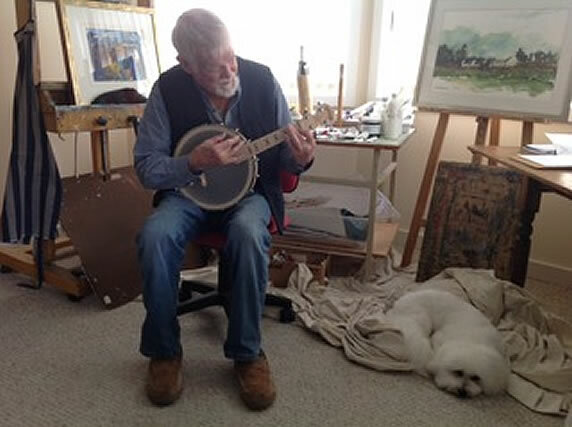 It’s a 3/4 scale instrument at 32.25 inches – short scale is considered 30 inches and full scale 34 – so it’s quite comfortable to get around. The pickups are specially designed D’Angelico humbuckers, with plenty of bottom end and punch, yet bright and articulate. This bass dates to 2015, and though there are no Country Of Origin markers, we suspect it is from a top shelf Korean builder such as Cort. The Excel SD plays very well, and has a great sound. This example is in very good condition and the original hard shell case is included.